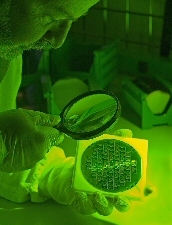 NOVA offers a wide variety of unique dielectric and conductive thin films to satisfy your MOS and MEMS process requirements. Services are available on silicon wafers as well as other materials such as quartz, sapphire and aluminum nitride. Wet Thermal Oxide is preferred when growing thick oxide. Dry Thermal Oxide is available for those applications requiring a thinner oxide. Dry Chlorinated Thermal Oxide with Forming Gas Anneal is recommended for use in MOS and other active device fabrication processes. Dry Thermal Oxide 100 - 3000Å 2" - 12"
Forming Gas (H2/N2) Anneal 100 - 3000Å 2" - 8"
Wet Thermal Oxide 1000 – 60,000 Å 2" - 12"
Stoichiometric 50-4500Å 2" - 12"
Low Stress (stress less than 250 MPa) 50 – 20,000 Å 2" - 12"
Super Low Stress (stress less than 100 MPa) 50 – 40,000 Å 2" - 12"
PECVD allows thin film deposition at lower temperatures than those found in LPCVD processing and can be useful for wafers that require minimal thermal processing. Nitride Deposition 100 - 5000Å 2" - 12"
Nitride - Low Stress 100 – 20,000 Å 2" - 12"
PECVD Oxide 100 – 50,000 Å 2" - 12"
PECVD OxyNitride 100 – 20,000 Å 2" - 12"
PECVD Silicon Carbide 100 - 2000Å 2" - 12"
Polysilicon Deposition 1000 – 20,000 Å 3" - 12"
Contact NOVA for more information about custom films. Phone us at (972)478-7002 or submit an online Service Request.